As if all of these lofty credentials and great experience weren't enough, Ben is seen here playing the very same mandolin that you hear in Francis Ford Coppola's The Godfather parts I and II, and in Dr. Zhivago. The 1914 Gibson F4 belonged to Ben's grandfather, Maxwell Gralnick, who played the instrument on the scores of those great films and others. It would take a lot more than gray skies to repress San Franciscan Ben Brussell. The busy film and concert composer studied violin and viola with the San Francisco Symphony's Leonid Gesin and Daniel Kobialka and holds a Bachelor's degree in viola performance and musicology from San Francisco State University. He studied chamber music with Laszlo Varga and classical composition with Ursula Mamlok from the Manhattan School of Music. Ben is a graduate of the Master's Level program in film scoring composition at the University of Southern California. There, he studied with film composing legends Elmer Bernstein, Jerry Goldsmith, and David Raksin. Ben has performed as a soloist with the Berkeley and Bakersfield Symphonies. 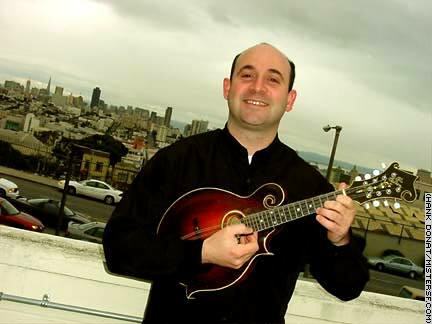 His classical mandolin debut was in 1999 at Davies Symphony Hall, in the premiere performance of the Hoffman Serenade in D Major with San Francisco Symphony violist, Leonid Gesin. Ben is the founder of the world music ensemble KLEZMANIA! and the Bay Area classical music ensemble, Three Strings & A Mandolin. Ben is also a member of the Modern Mandolin Quartet.